Redland City Council has taken the precautionary action of closing Thompson’s Beach after routine monitoring showed elevated levels of enterococci bacteria. Council has erected warning signs advising residents of the temporary closure and will undertake ongoing sampling to advise when the beach is reopened. 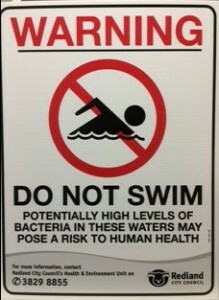 While low levels of Intestinal enterococci are often found in waterways, the samples exceed “Action Trigger” levels and as such Council made the decision to close the beach in accordance with Healthy Waterways Healthy Waterplay guidelines. Intestinal enterococci are considered the most accurate indicator of the potential for human health risk in marine and freshwater, so Council felt it was important to close the beach in the best interests of community health. Exposure to polluted waterways can lead to mild illness such as stomach upsets or infections; anyone with these symptoms should visit their doctor for medical advice. Posted in Community, Environment, Parks and tagged .